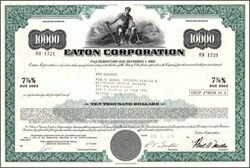 Beautifully engraved certificate from the Eaton Corporation issued in 1974-78. This historic document was printed by the American Banknote Company and has an ornate border around it with a vignette of an allegorical man holding a hammer. This item has the printed signatures of the Company’s President and Secretary and is over 23 years old. Eaton Corporation is a global $8 billion diversified industrial manufacturer that is a leader in fluid power systems; electrical power quality, distribution and control; automotive engine air management and fuel economy; and intelligent truck systems for fuel economy and safety. Eaton has 54,000 employees and sells products in more than 50 countries.